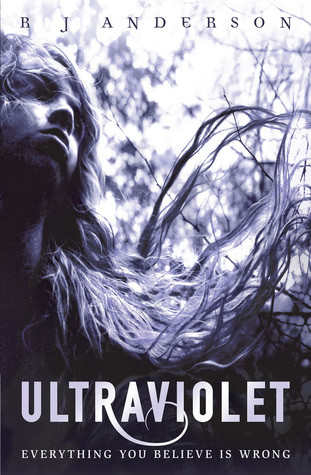 Ultraviolet by R.J. Anderson is the first NetGalley book that I’m going to review on the blog. I really enjoyed reading Knife, which is the first book in a series about faeries. I already have copies of the sequels but I haven’t had the chance to read them yet. Since my request for Ultraviolet got approved, I thought I might as well bump this up the to-be-read pile. Such an unusual book! After finishing it, I had no idea how I’d write the review because so many unexpected things happened in Ultraviolet. At first, I thought it was going to be a straight up contemporary YA novel set in a mental institution for teens. I was worried that it would be too gritty or bleak for my taste but that didn’t happen. Instead, the novel transformed into something with hints of magic realism with maybe a bit of fantasy and to my surprise, science fiction was thrown into the mix. Sorry for being so vague! I really don’t want to ruin the reading experience for any of you – a huge part of why I enjoyed this book was because it kept me guessing. Just when I thought I had things figured out, something happened that completely changed the dynamics of the story. I was engrossed because I had no idea what would happen next so I kept reading until I reached the end. I have a feeling that other people might not like where the story went in the second half of the book but it worked for me. I felt bad for Alison through the course of her story because it seemed like no one really understood her – her parents, her best friend and even her psychiatrist. She knows that she’s different from everyone else so she keeps a tight rein on herself – she tries to pretend that there’s nothing extraordinary about her. Alison is a reserved person as a result of that and she doesn’t normally reach out to other people. I really liked Alison’s point of view because she has a fascinating way of seeing the world around her. How she perceives her surroundings makes her descriptions of the scenes so vibrant and full of life. Alison is one of the main reasons why I think Ultraviolet is so different from other YA books out there. Half the time, I wasn’t even sure if Alison and her friends in the institution were really crazy or not. Although it wasn’t the focus of the story, there IS a romantic interest for Alison and I thought the whole thing was sweet. Again, I apologize for not being clear but I am hoping that what I’ve said has made more people curious about this book. I want to know what the rest of you think and whether you’ll enjoy reading this as much as I did. Well you have succeeded in making ME curious. Shoot. Yes, success! Janice, it’s available in NetGalley in case you’re interested in signing up. great review – you’ve made me want to read it so I can see what’s going on! I hope you get to read this, Allison! This totally has me curious about Ultraviolet. I do have this on the netgalley queue but have been ignoring it in favor of other books. Yay, you have a copy already. I hope you get to read it soon because I really want to know what other people will think of it. I haven’t seen that many reviews in the blogopshere. Hasn’t this been released already? Or is that just in the UK? It’s just out in the UK. It comes out in the US in September. Which isn’t that far off…. Sounds really interesting, Chachic! Is it told from a first person POV? When you mentioned that you weren’t sure if they were crazy or not, I became intrigued by how the author kept that ambiguity alive. Hi Chris, yep, it’s told from a first person POV. That’s the thing with fiction set in a psych ward, I feel like anything could happen and I have no idea if the characters are really crazy or what they believe in is true. I’m sold! But I’ll wait for the book–I can’t read comfy-like on the computer! Charlotte, I know what you mean. I have a hard time reading ebooks on the computer too but there wasn’t any other way to read this book. I put this one on my wish list, because your review intrigues me. Hope you get to read this soon! I plan to read the book in the next days and after reading your review I’m very curious (in a good way) about the story. I hope you like it! I’m starting to feel scared that you guys won’t like it but I looked at other reviews and all of the ones that I’ve seen so far have been positive. i read a spoiler for this book (!) which is kind of annoying now as i have been getting increasingly interested in reading it. i really hope my lib gets it in! Aww Nomes, I feel bad that you read a spoiler for this book! This is why I was so vague in my review, I didn’t want to ruin the reading experience for other people. Even the links that I posted at the bottom are all spoiler-free. Hope you still get to read it though. I didn’t even notice the tagline until you pointed it out! But yes, it did live up to that phrase.